I love this time of year! The lights, the sparkle and the magic in the air. AND you get to work with lots of glitter!!! 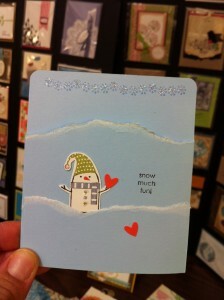 If you haven`t got your Christmas cards made up or are looking for inspiration come on out to a class. I wanted to share this card with you. I`m not sure who designed it unfortunately but I love love LOVE it! I will be creating some cards with this stamp set today as I’m away at a Stamp-A-Rama crafting retreat in Harrison Hot Springs Resort! SO MUCH FUN!! The ladies are all great and its a great atmosphere to be creative and just work like a bee. Everyone is enjoying themselves and what they do. I can’t wait to share all the amazing projects I’m doing. Stay tuned. Very exciting. So this stamp set is absolutely adorable and is Stampin`Up! of course. 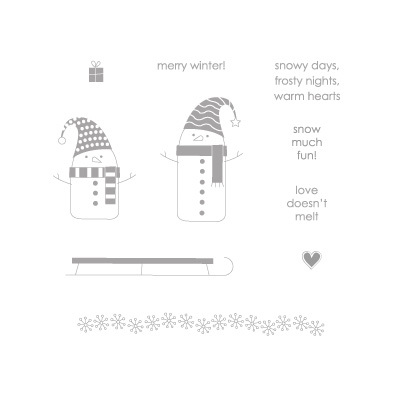 It`s called Merry Winter and I have the set pictured below.